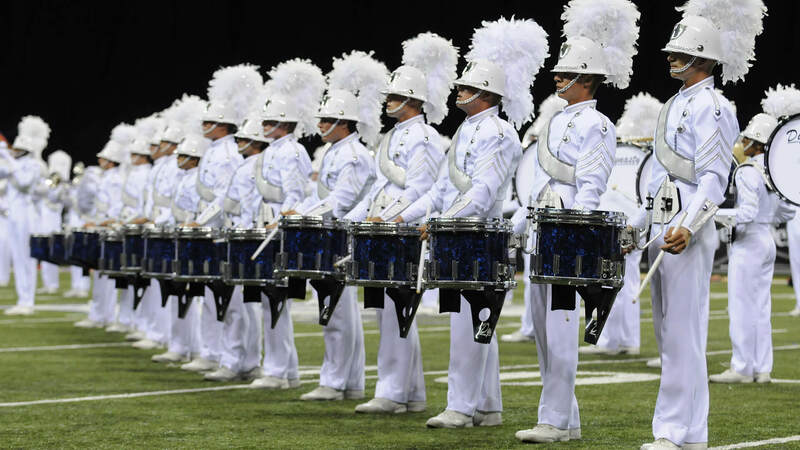 The 2009 season saw the DCI World Championships move into the indoor Lucas Oil Stadium for the first time, as temperatures outside the brand-new facility swelled past 90 degrees and the heat index blazed past 100. Blue Devils enjoyed an undefeated season and achieved the corps’ 13th DCI title, all while capturing four of the five caption awards and receiving perfect scores from three judges in the Finals. The Cadets changed their name to Holy Name Cadets for their 75th anniversary, the name that was first attached to the corps by their founding Garfield, New Jersey parish. In playing music from “West Side Story,” the corps continued its string of playing something from the musical for the sixth decade. The defending champions, members of Phantom Regiment finished in ninth place with “The Red Violin,” telling a poignant story of love, deception, forgiveness, and ultimately, redemption. Throughout the show, the corps filled the field with musical imagery, including an oscilloscope-like drill evolution of the four strings of a violin vibrating and arcing into one another when plucked, assorted violin drill shapes (and half violin shapes), and rotating “f holes,” the holes on the top of a violin that allow the tone to reverberate inside the instrument and then escape to the ears of the listeners. Musically, the show included a segment from John Coriglioni’s “The Red Violin,” the soundtrack to the 1998 movie of the same name that traced the history of a haunted violin over 300 years. Corigliano, who had already written movie scores for “Altered States” and “Revolution,” won the 1999 Academy Award for Original Music Score for his soundtrack. A single work by Nicoló Paganini was the musical inspiration for the rest of the show. Born in 1792, the early Romantic-era composer did little to dispel the ongoing rumor that his mother made a pact with the devil when he was six years old in order for him to become the greatest violinist the world has known. A large part of the public really believed he had traded his soul to become a legend, and so the church refused to officially bury him for 36 years. Paganini’s “24th Caprice in A Minor,” the final segment of a 24-movement work for violin written before 1810, is one of the most difficult works ever composed for the instrument. This final movement has been the inspiration for dozens of works by subsequent composers. One of those works included in Regiment’s show was “Fantasy Variations on a Theme by Paganini” by James Barnes, a famed American composer for wind bands. The United States Marine Band commissioned the work of 20 variations in 1988. Witold Lutoslawski’s “Paganini Variations” of 1941 was written for two pianos while the Polish composer played piano in various Warsaw cafés to make a living while the Nazis occupied the nation. This work survived the devastation of the Warsaw uprising, while much of the composer’s output didn’t. Paganini’s original themes are clearly heard in Lutoslawski’s treatment, which embellishes the piano parts with spectacular flourishes reminiscent of the brilliance Paganini wrote into the original violin work. Sergei Rachmaninoff’s “Rhapsody on a Theme of Paganini” for solo violin and orchestra was written in 1934. The corps performed the famous “Variation 18” of the “Rhapsody” in 1995, but utilized less-known material from the work for this show. The famed jazz clarinetist and big band leader Benny Goodman is most famous for performing Louis Primi’s “Sing, Sing, Sing” of 1936. But even he couldn’t’ resist the lure of the Paganini work when he wrote the hard swinging “Caprice XXIV” in 1942. Soaring mellophones and blazing mallet runs caught the excitement of the swing era and the intensity of a nightclub. Philip Wilby is best known for his compositions for British brass bands. His “Paganini Variations” includes a theme and 14 variations based on the famed melody and composed for the BBC radio program, “Band of the Year, 1991.” In his work, Wilby sought to combine Paganini’s romanticism with his own contemporary sensibilities, referring to the combination as an arranged marriage. Setting up the story of the production, the start of Regiment’s show focused on a young, poor musician doing his best to support his new bride by playing on the street for tips in his violin case. The character was playing on a real violin, but by all standards, he was awful. The show began with the Paganini original that was to inhabit most of the show, performed by a synthesizer in the front ensemble as a street salesman tried to sell a magical violin to the performer’s wife. Encountering the magical violin his wife purchased, the struggling violinist, (a guard member who spun and tossed the red half-violin shape), became a superb virtuoso and was quite soon showered with praise and riches. He didn’t handle the sudden fame too well, and allowed himself to be seduced by a devious woman he met in a nightclub (during the Benny Goodman piece) after a triumphant concert. She convinced him to leave his wife and from then on, his life went downhill as he allowed fame to go to his head, caring little about those who stood by him when he was an unknown. His new flame turned out to be in the relationship only to steal his violin for personal monetary gain. After pilfering the instrument, she disappeared into the night, leaving the violinist wracked with guilt and emotional pain. He then went back to his wife and begged for her forgiveness. Together, they set off to find the thief and recover the violin. Perhaps the most famous slap in drum corps history echoed across the field as the wife got her revenge on the seductress, and the married couple got back together for good and lived out the rest of their lives in harmony, he all the wiser for what he learned about himself and the risks of dealing with sudden fame. For this week only, you can save on the World Championship DVD or Blu-ray set that contains this complete Phantom Regiment performance, along with all finalists from the 2009 DCI World Championship. Discount video offer ends Monday, October 12, 2015.